Monsters provoke fear to generate power for their city, but two of them discover an important secret. 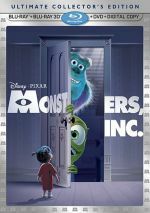 Though 2001’s Monsters, Inc. became a big financial success, I thought it marked a minor chink in Pixar’s creative armor. While I felt it offered an enjoyable movie, it offered the first Pixar effort that I didn’t love. Monsters Inc. operates from the basic childhood fear that monsters lurk in our closets. Actually, it turns out that they use closets simply as portals to get into kids’ bedrooms. From there, they terrify them to nab wee screams, which they use to power their own monster realm. We meet a successful scream-catcher team. James P. “Sulley” Sullivan (voiced by John Goodman) does the prime terrifying, while his assistant Mike Wazowski (Billy Crystal) runs the behind the scenes machinery to capture the shrieks. All goes well for the boys, at least until one disastrous outing. After hours, Sulley finds a mysterious door and tries to check out why it’s there. By accident, a tot comes back to Monstropolis with them. As it happens, monsters feel absolutely terrified of little kids, and they even think there’s nothing more toxic and harmful than the touch of a child. Not surprisingly, it causes a panic when little “Boo” (Mary Gibbs) invades their world. The authorities discover her presence, so Mike and Sulley need to find a way to deal with the child problem. That complicates when they discover a plot led by competitor Randall (Steve Buscemi), and it doesn’t help that Sulley and Boo become pretty attached to each other. The rest of the movie follows attempts to keep Boo undercover from the authorities while they also avoid the problems posed by sleazy Randall. At its heart, Monsters enjoys a tremendously clever premise. Pixar flicks usually emanate from a simple but winning notion such as toys that come to life when kids aren’t around. The concept that children really do have monsters in their closets is terrific, and the twist that shows the beasties to be more afraid of us than we are of them makes it even more compelling. At times, Monsters exhibits the spark that one expects from Pixar, and it displays a wonderfully lively visual world with lots of viscerally compelling elements. The screen always pops with different pieces that keep us amused and entertained. The film also features the usual stellar cast. Goodman brings both the right tones of warmth and menace to Sulley, so we buy him as a nice guy and as a scary monster. The movie requires more of the former element, but Goodman moves effortlessly between them. I never much liked Crystal, but he appears perfectly cast as the high-strung assistant Mike. He tosses off his lines with the requisite zing and makes the character neurotic but likeable. Even tiny Mary Gibbs – only a couple of years old when recorded – creates a lively and charming personality. And yet, I still don’t find myself as impressed with Monsters as I might expect. I truly loved all three prior Pixar films, but I merely enjoyed Monsters. The movie goes by quickly and it keeps me entertained, but it lacks the easygoing charm of the previous Pixar entries. Part of the problem – actually, most of the problem – relates to the Sulley/Boo relationship. That side of the story tends to drag Monsters into a sappy side that doesn’t work very well. The best Pixar flicks meld emotion and wit neatly so that the former never overwhelms the latter. Unfortunately, Monsters becomes syrupy at times. The bond between the two characters seems charming but overly sugary. Ultimately, however, I can’t really put my finger on the reason I like Monsters, Inc. substantially less than I care for the best Pixar films. To be sure, it provides a lively and consistently entertaining experience, and I still recommend it to fans. It just lacks that spark that drives the strongest of the studio’s movies. Monsters is good, not great. I won’t damn the picture because of that, but I must admit I still feel a little disappointed by the result. Monsters, Inc. appears in an aspect ratio of approximately 1.85:1 on this Blu-ray Disc. I had high expectations for the image of Monsters, but nothing here disappointed me, as the disc offered a virtually flawless visual presentation. Sharpness seemed immaculate. At all times, the movie remained terrifically crisp and detailed, and not a single instance of softness or fuzziness occurred. The image stayed detailed and distinct from start to finish. No signs of jagged edges, moiré effects or edge enhancement appeared, and the movie also was totally free of any source flaws. As with the other Pixar flicks, they created the transfer straight from the original computer files, so this ensured a presentation completely devoid of any defects. The fantasy setting of Monsters offered a nicely bright and varied palette, and the disc reproduced the colors wonderfully. From the broader tones of the monster world to the more natural and lifelike hues found in the human realm, the colors always came across as vivid and lively, and they appeared absolutely gorgeous at all times. Black levels also seemed deep and rich, while shadow detail looked appropriately heavy but not overly dense. In the end, Monsters, Inc. provided a clear and exciting visual presentation that never faltered. Almost as strong was the film's DTS-HD MA 5.1 soundtrack, as the soundfield seemed broad and engaging. For the most part, the forward spectrum dominated, but the entire package seemed well distributed and nicely balanced. It provided a virtually seamless mix that spread the audio cleanly between the various channels. Effects and music often emanated from all five speakers, and the sound blended together neatly so that the environment seemed smooth and convincing. Various auditory elements appeared precisely located in the spectrum; even dialogue was focused in the correct location across the front speakers, and we also heard some speech from the rear when appropriate. The surrounds contributed excellent reinforcement of the information and also used split-channel details quite effectively. Best of the bunch was probably the climactic sequence that included the many flying doors in the factory. It created a vivid and engaging setting. Equally solid was the quality of the audio. Speech appeared warm and natural, with no signs of shrillness or concerns related to intelligibility. Music sounded clear and smooth, with terrific range; the score seemed appropriately brassy and bright. Effects were the best part of the package. They appeared very accurate and realistic and showed no signs of distortion or harshness. The track boasted fine resolution and terrific depth, with solid bass response throughout the flick. Overall, the audio packed a fine punch and added a lot to the Monsters, Inc. experience. This package includes both the movie’s 2D and 3D versions. The picture comments above reflect the 2D edition – how does the 3D compare? In terms of visual quality, the two seemed largely the same. The 3D version takes a minor hit in terms of definition, but this feels insubstantial, so this edition remains very appealing. As for the stereo presentation itself, it offers a good layer of depth. For the most part, this doesn’t become the most ambitious 3D image, but the format adds a nice sense of place and dimensionality. If you want “showy” visuals, though, head to the film’s climax. With all the snow and the sled ride, the scenes in the Himalayas excel, and then the segment with all the doors at the factor becomes a wonderfully dizzying ride. Though the 3D version doesn’t consistently dazzle, I think it turns into a fun way to watch the movie. Note that the audio options differ between the two versions. While the 2D movie goes with DTS-HD MA 5.1, the 3D includes both Dolby TrueHD 7.1 and Dolby TrueHD 5.1. That’s a nice bonus and gives the 3D version a sonic boost. On 2D Disc One, we encounter an audio commentary from director Pete Docter, co-director Lee Unkrich, executive producer John Lasseter, and executive producer/screenwriter Andrew Stanton. It may seem like all four were recorded together for this screen-specific track, but they weren’t – I think. It sounded like Docter and Unkrich sat together, and their remarks strongly dominated the piece. Lasseter and Stanton apparently were taped together in a separate session. The producers of the commentary then integrated those statements into the track with Docter and Unkrich. However, a couple of examples arose in which it sounded like the whole crew sat together, so who knows? I get confused just thinking about it! In any case, since all these guys appear on other Pixar commentaries, they seem comfortable with the format and we get a lively and informative track. As with prior Pixar commentaries, they cover some useful technical details that communicate issues related to the animation, but the emphasis remains on characters, cast and story. They provide lots of great information about how they chose the various actors, how the characters and plot elements developed throughout production, and many other fun tidbits. Heck, when they can’t recall why they dropped one plot point, they even phone co-writer Dan Gerson to get the answer! Overall, this commentary offers a compelling and educational track that I thoroughly enjoyed. As the disc starts, you get a 91-second introduction from Docter. He gives us a quick overview of what we’ll find in the set. It’s insubstantial but painless. Filmmaker’s Roundtable reunites Docter, Unkrich, producer Darla Anderson and story supervisor Bob Peterson to discuss Monsters. During this 21-minute and 35-second piece, they chat about the Hidden City Café, the chimp from the original DVD, the film’s development, character/story issues, Docter’s challenges as director, favorite scenes, the impact of 9/11 and various anecdotes. Some of the info repeats from the commentary, but we get a good retrospective perspective and plenty of new details. The four participants interact well and they provide quite a few nice notes. This is a quality program with solid reflections on the flick. If you can’t visit Tokyo Disneyland, check out Monsters, Inc. Ride and Go Seek: Building Monstropolis in Japan. In this seven-minute, 58-second piece, we hear from Docter, Walt Disney Imagineering Senior VP Joe Lanzisero, Pixar/Theme Parks creative director Roger Gould, Walt Disney Imagineering principal show producer Mark Schirmer, and Oriental Land Co., Ltd. show overall Yukio Nakajima. They tell us about the “Ride and Go Seek” attraction as well as some aspects of the overall park. This occasionally feels like an ad, but it’s an engaging and reasonably informative one. Next we find two shorts. Created for the original 2002 DVD, Mike’s New Car lasts three minutes, 48 seconds; John Goodman and Billy Crystal reprise their roles as Sulley and Mike. A very simple piece, Car offers a lot of funny gags. In fact, this brief cartoon might include more true laughs than all of Monsters itself. Car definitely merits a look. You can watch Car with or without commentary from Docter and Gould. However, this doesn’t feature directors Pete Docter and Roger Gould; instead, we hear from their kids, Nicholas Docter and Leo Gould. They try to explain how their dads made the film, and they offer lots of silliness during this hilariously irreverent commentary. For the Birds offers the short that appeared prior to theatrical showings of Monsters. The cartoon lasts three minutes, 28 seconds and offers a cute and entertaining little piece. Another commentary accompanies Birds, but this one’s for real, as we hear from director Ralph Eggleston. He offers a fairly technical track that quickly runs through the project’s genesis and some fine points about the animation. He also provides a few more general remarks during this short but engaging commentary. When you start 2D Disc One, you’ll find the usual complement of advertisements. Here we get clips for Toy Story 3, Up and Dumbo. These also appear in the Sneak Peeks area along with clips for Santa Buddies, Ponyo, Disney Parks and Blu-ray Disc. Note that the 3D disc includes 3D promos for The 3D disc opens with ads for Monsters University and Planes. A few other extras appear on the 3D disc as well. We find 3D versions of For the Birds and “Outtakes and Company Play”, pieces found in 2D on Disc One. 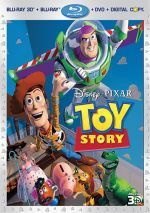 The 3D disc adds Toy Story Toons: Partysaurus Rex, a fun six-minute, 34-second clip with adventures of the Toy Story gang. Batten down the hatches, pull up a chair, and brace yourself: now we move to 2D Disc Two, which includes scads of supplements. Something new arrives first: Roz’s 100 Door Challenge. This places you as an applicant at Monsters, Inc. and you have to answer 100 questions to “win”. Some of these relate to the movie, while others require simple math or other skills. If/when you answer three incorrectly, the game ends and you’re assigned a position at the company. You end up with a more prestigious job if you score high. The difficulty of the questions varies quite a lot, but the game is moderately forgiving. It’s not a barrel of fun, but it’s better than most of these games. From there all the extras appear “behind” two separate “doors”: “Humans Only”. Called Pixar, the first of the seven domains under “Humans Only” consists solely of the Pixar Fun Factory Tour. Hosted by John Lasseter and Pete Docter, this three-minute, 46-second piece quickly shows us through the new Pixar studio. It seems superficial but fun. When we shift to Story, we get four subdomains. Hosted by co-director David Silverman, Story Is King provides another of the featurettes that comprises the “Production Tour”. The 123-second clip features remarks from story supervisor Bob Peterson and director Pete Docter as they discuss the storyboard pitch process and other creative elements. This is old news for veterans of these kinds of discs, but it’s quick and interesting nonetheless, and it provides information crucial for newbies to learn. The 92-second Monsters Are Real offers movie clips and quick comments from actors Billy Crystal, James Coburn, and John Goodman, writer Andrew Stanton, Walt Disney Feature Animation President Thomas Schumacher, executive producer John Lasseter, co-director Lee Unkrich, and producer Darla Anderson. They quickly discuss the story’s main conceit that kids are scary to monsters. It’s fairly useless but at least it’s brief. The Original Treatment seems much more worthwhile. This 13-minute, 44-second program combines filmed artwork with light background music and narration to communicate the film’s first incarnation. No Sulley, no Mike, no Boo – in fact, very little of the finished flick appeared in this rendition. That makes it all the more compelling, and it definitely merits a look so we can see just how radically the plot and characters changed from beginning to end. More early material shows up in the Story Pitch: Back to Work (Early Version), Bob Peterson acts out the boards for a prototypical rendition of the scene in which Sulley and Mike bring Boo to the factory for the first time. It also differs heavily from the finished piece, which means it offers some very interesting viewing within the four-minute, 38-second clip. Within Banished Concepts, we see other discarded ideas. Lee Unkrich offers a 30-second “Introduction” to the area, and then we can check out four difference scenes: “Assistant Sulley” (135 seconds), “End of Day” (155 seconds), “Bad Scare” (180 seconds), and “Scream Refinery” (67 seconds). All provide story reel renditions of the segments. Some of these bear some resemblance to the final film. The main difference comes from Sulley’s position as an assistant and not a scarer. The “Original Sulley Intro” offers some fairly complete computer animation. The 60-second clip shows a slightly different way to first view Sulley. It doesn’t provide the wonders of the radically altered footage we saw earlier, but it offers an interesting piece. Next comes a Storyboard to Film Comparison. This allows us to view one scene in two different states: storyreel only, and final color only. We can also check out a split screen comparison of the two. You can use the angle button to cycle through the three presentations. The moderately interesting piece lasts five minutes, 42 seconds, as it offers the first sequence in which Sulley and Mike dealt with Boo. Under Art Gallery, we find tons of images. Characters looks at 24 domains. We check out “Mike Wazowski” (42 stills), “James P. Sullivan” (137), “Boo” (60), “Sulley and Boo” (9), “Henry J. Waternoose” (21), “Randall” (28), “Rivera” (3), “Celia” (19), “Roz” (15), “Fungus” (4), “Jerry” (6), “Ted” (6), “Smitty” (13), “Needleman” (2), “George” (4), “Claws” (6), “Bile” (6), “Harley” (9), “Bud” (3), “Bob” (4), “Ricky” (4), “CDA” (11), “Monster Wannabes” (46), and “Yeti” (31). All are interesting to see, and in a nice touch, they’ve been rescanned for high-def. That means they look much better than they would if they’d just been ported over from the old DVD. Essentially, Color Scripts seem to be very small pieces of art that show the director of photography how the hues should look in various scenes. We get 164 examples of these drawings here. Concept Art breaks into eight subdomains. We look at “Apartment” (5), “Boo’s Bedroom” (6), “Door Station” (16), “Door Vault” (31), “Environments” (35), “Monsters, Inc.” (40), “Monstropolis” (72) and “Scare Floor” (22). Finally, Posters gives us 29 ads. All of these collections continue to provide interesting pieces of art. Designing Monstropolis lasts two minutes, 51 seconds and comes hosted by David Silverman. We also hear from Lee Unkrich John Lasseter and production designer Harley Jessup as we get another quick look at one part of the film. The piece seems brief, but it nicely introduces the topic. Hosted by Docter and Unkrich, Set Dressing Intro runs three minutes, 22 seconds and mainly features information from set dressing supervisor Sophie Vincelette. She leads us through a solid look at the way the artists populate the sets with different props and items and how they integrate them into the film. Location Flyarounds (7:25) covers five different spots. We see quick computer-drawn moves through some largely unpopulated sets: “Downtown”, “The Apartment”, “Monsters, Inc.”, “Simulator”, and “Boo’s Room”. I liked this section, as it offered a great look at the basic locations. One even includes a few humorous touches that I’ll let you discover on your own. After this we head to the Monster File. Cast of Characters lasts five minutes, 54 seconds and comes hosted by Pete Docter, Lee Unkrich, Darla Anderson, and David Silverman. We mostly get comments from Docter, Unkrich, Anderson, Lasseter, Andrew Stanton, Thomas Schumacher, Billy Crystal, John Goodman, Mary Gibbs, James Coburn, Jennifer Tilly, and Steve Buscemi. We see a few quick shots from the recording studio, but mostly we just get some short and superficial sound bites that don’t offer a lot of depth. What Makes a Great Monster? runs 87 seconds, and it includes character designer Bob Pauley and shader/art director Tia Kratter as they quickly discuss the visual elements of the monsters. This segment essentially originally acted as an introduction to the “Character Design” stillframe gallery on the DVD. It seems odd to find it placed separately here, but it’s still a decent overview. Within Animation, we get six subsections. Animation Process runs three minutes and 14 seconds. Featuring comments from Docter, Silverman, Unkrich, supervising animator Glenn McQueen, and simulation and effects supervisor Galyn Susman, it follows one specific scene and shows how it went from storyreel to layout to animation to simulation shaders and lighting. This offers a nice walk-through of the various elements. Early Tests includes commentary from supervising technical director Thomas Porter, simulation and effects sequence supervisor Steve May and sequence supervisor Michael Fong as we view preliminary designs for some of the characters. The eight-minute, 15-second piece mostly covers issues related to Sulley and his fur, and we also see some tests for Boo and Mike. It’s a fascinating look at the growth and variation in the characters. Next we take a look at the Opening Title Animation. This 129-second piece includes remarks from Docter and main title design and animation director Geefwee Boedoe. They relate the genesis of the sequence as well as some of its details and offer good notes about the subject. For a view of the most significant production challenges, check out Hard Parts lasts five minutes and includes comments from Thomas Schumacher, Lasseter, Docter, Silverman, Unkrich, Thomas Porter, Steve May, Michael Fong, Pixar CEO Steve Jobs, modeling artist Steve Milliron, simulation and effects sequence supervisor Mark Henne, and modeling artist Guido Quaroni. Parts of this dealt with fur and clothing, which seemed redundant after the “Early Tests”, but the featurette still offered enough new info to become worthwhile. A two-minute, 15-second featurette about the Shots Department describes their work. We hear from Galyn Susman as she tells us more about fur and clothes. The information takes a slightly different stance than what we learned earlier, but the information still came across as somewhat redundant. Nonetheless, enough new material appeared to make the clip worth a look. The final component of the “Animation” domain, the Production Demonstration allows you to see a scene in various forms. After an “Introduction” from Unkrich, you can check out a scene via four different views: “Storyreel”, “Layout”, “Animation”, and “Final Color”. This provides a nice examination of the varying stages of completion. Time for Music and Sound, the penultimate domain in the “Humans Only” area. It starts with Monster Song. This three-minute, 18-second segment includes quick comments from Billy Crystal, John Goodman, Docter, Lasseter, composer Randy Newman, Thomas Schumacher as well as shots from the recording sessions. This also provides some shots of Newman’s own version of the vocals. It’s another quick and superficial piece, but it’s fun to watch the recording. Sound Design runs four minutes, 16 seconds, and it features remarks from sound designer Gary Rydstrom and co-sound designer Tom Myers as they cover the topic. We watch as they discuss the challenges and add specific elements to the mix. Like some of the other pieces, it remains fairly short and superficial, but it adds some good information along the way. Lastly, we head to Release, a domain that deals with promotional elements. The Premiere shows 58 seconds of footage from the film’s LA debut. It’s cute but insubstantial. Toys gives us a 92-second party in which Lasseter and some of his cohorts play with the flick’s trinkets. This also features a few comments from toy designer “Ricky” – they don’t identify him beyond that. I felt disappointed by this section, as it should have tossed in a still gallery of all the toys created for the movie; instead, we get a scattershot and fairly uninformative discussion of them. Outtakes and Company Play (5:27) shows the usual collection of fake bloopers, though “Company Play” adds something different: it lets us see the stage production Mike refers to in the movie. Both are amusing. Trailers and TV Spots includes a teaser, two theatrical trailers, and four TV ads. The teaser and the second trailer both consist of unique material, so they’re easily the best parts of this section. The International Inserts domain shows some of the changes made for non-US releases. This offers a look at the translations and other visual alterations as well as some remarks about casting for dubbing. The Multi-Language Clip Reel depicts the results of those efforts. The three-minute and 47-second piece translates different parts of one scene into German, Japanese, Euro-Portuguese, Norwegian, Dutch, French, Swedish, Polish, Italian, Brazilian Portuguese, Icelandic, Danish, and Hebrew. Finally, Wrap-Up offers a brief 42-second reel that finishes off the collection of featurettes found on the disc. On the original DVD, you could watch the clips as part of a “Production Tour” that doesn’t appear to repeat here. The “Wrap-Up” made more sense when viewed at the end of “Production Tour”, but here it just seems confusing. Hooray – I can finally open the second door and enter the “Monsters Only” area! This splits into three different domains, each with subtopics. New Monster Adventures launches with Monster TV Treats. It lasts a total of 73 seconds and offers six short animated clips that focus on Thanksgiving, Christmas, baseball and football. I’m not terribly sure where all of these aired, though at least one clearly mentions Monday Night Football, so I’d assume it ran as part of that broadcast. Whatever their origins, these are fun to see. More alternate animated material appears in Ponkickies 21. Created for a Japanese TV program of that name, this absolutely bizarre feature shows dubbed versions of Mike and Sulley as the play “Janken” – the Japanese form of Rock, Paper, Scissors – and the “Lucky Door Game”. These brief but freaky pieces may merit the purchase of this disc all on their own! I don’t need to drop acid; I can just watch Japanese children’s TV instead. The final part of “New Monster Adventures”, we find a music video for “If I Didn’t Have You”. This fairly pointless 73-second piece compiles movie clips played along with the John Goodman and Billy Crystal rendition of the tune. Next we move to Behind the Screams. On the Job With Mike and Sulley gives us a two-minute and 33-second provides a news report that features our pals. An anchorman interviews the pair to learn their scream-collection secrets. As always, it features the original voices, and it offers an entertaining addition. Finally, the Orientation area introduces us to the Monsters, Inc. factory. Welcome to Monsters, Inc. lasts 56 seconds as it shows the entire commercial excerpted during the film. Your First Day provides a short “training film”. It lasts three minutes, 36 seconds and compiles movie clips and production art. Though a little cheesy since it comes from bastardized sources, it’s another fairly entertaining extra. History of the Monster World looks like a deleted sequence from the film. It runs like a storyreel as we learn how the monster world came into being and why they started to scare humans. It lasts 100 seconds and seems cute and fun. Finally, a fourth platter provides a DVD Copy of Monsters. This replicates Disc One of the original 2002 release – and I do mean literally. It still includes the same previews that tell us Treasure Planet is “coming soon to theaters”! Obviously this DVD is redundant for fans who already own the old release, but for the 11 or 12 Pixar partisans who never bought it and who aren’t yet Blu-ray capable, it’s a good bonus. As one who adored the first three films from Pixar, I expected great things of Monsters, Inc. However, while I enjoyed the movie as a whole, it lacked the spark that made the earlier flicks so special. Monsters provided a reasonably fun experience, but it never took off and became something truly special. On the other hand, the Blu-ray looked absolutely amazing, and it also featured excellent audio and many interesting supplements. Though not Pixar’s best, the film entertains, and the 3D version adds some zing to the presentation. To rate this film, visit the original review of MONSTERS, INC.